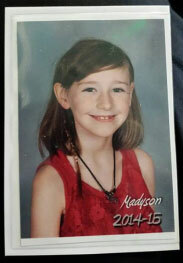 Madyson “Maddy” Middleton was reported missing around Sunday at 6 p.m.
Update 7/27 9:45 p.m. : The body of an eight-year-old girl who was last seen outside the Tannery Arts Center Sunday evening has been found. A male teenager was reportedly arrested in connection to the case. The FBI has joined the search for a missing 8-year-old girl who was last seen Sunday afternoon riding a scooter outside the Tannery Arts Center in Santa Cruz around 5 p.m. The Santa Cruz Police Department and Sheriff’s Office Search and Rescue Team, along with a specially trained K-9 Unit from the State Office of Emergency Services, have been working around the clock since Madyson “Maddy” Middleton’s disappearance. Santa Cruz police spokeswoman Joyce Blaschke told press there were no immediate signs of foul play, but “it was “suspicious to have a child missing this long.” Maddy was playing outside, visiting her mother, who lives at the Tannery Arts Center, when she went missing. Maddy has red-brownish hair and brown eyes, is 4 feet tall and weighs 48 pounds. She was last seen wearing a purple knee high dress with black leggings, and her hair was in a braid. Anyone who has seen Maddy is asked to call 911 or Santa Cruz police at 831-471-1170. Anonymous tips can also be sent to the tip line at 831-420-5995, or www.santacruzpolice.com or via text to TIPSCPD with your message to 274637 (CRIMES).